There’s a story in every home. Yes Realty Group believes in a premium experience. From the beginning to the end of a deal, we want our clients saying, I didn’t think I could be served like that from a salesperson. Raving fans you would say. People stand in line at Starbucks, they camp outside of stores for the newest Apple product. Why? They expect premium coffee and premium electronics. The group of clients who work with us get that premium experience. We are local, a full service company that has professional agents, who are excited to come to work each day, whose main goal is to serve at the highest levels. Yes believes in giving back. A harvest happens when you invest time and resources into a project, you nurture it, and watch it grow. We are given the opportunity by the people in our communities, to help them with the buying and selling of homes and land. To some, this is the biggest financial decision they make in their lives, and we are honored to serve them. Each of our agents has a cause that pulls at their heart strings. We all believe in giving back and having impact. 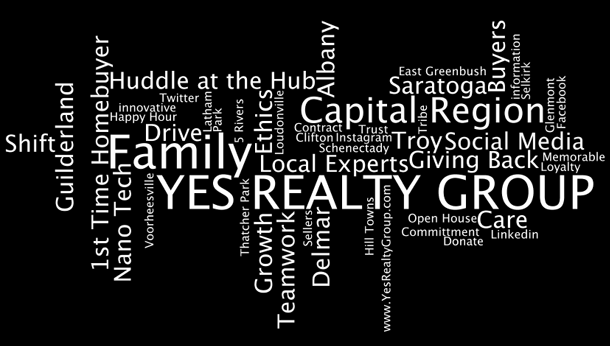 Yes Realty Group and each agent makes a donation from each closing towards their cause. It’s not just about money… It’s about volunteering, giving back, and supporting our communities. It can sometimes be easy to fill a seat, put a body at a desk and have a large number of people in a company. We don’t work that way. If you are passionate about serving your clients, we want to talk to you. If you need your face on the for sale sign, well, we’re not a match. We’ll go out of our way to make it happen for you… to help you be successful. The biggest company in the area… not us. But no one will have a bigger drive or commitment to our clients than our team. Times are a changin and we will change with it. Real Estate in the last few years has truly evolved. Paperless contracts… there here. Signing the contract on an Ipad in Starbucks… Do it all the time. We will invest and utilize technology as long as it makes it easier for our agents to serve their clients better. Personal growth, Change. Perceptions. Learning. Serving. We strive as a company to be better. Better at serving our clients. Better at being husbands and wives, Fathers and Mothers. We need to be looking at growth in our daily lives, practicing the ideals and values of a fully enriched life. We need balance in our work and family life. We will have more to give everyone… our clients, our families and our friends, if we strive to grow and be better.